I was born and raised in a family devoted to the arts. My father is an actor and a director, my mother a singer. Symphonic music, opera, and musical theatre soundtracks were staples of my early listening experience. As a child, I accompanied the exploits of my toy soldiers with original scores, fully orchestrated in my head. My first instrument, and the only one for which I had formal training, was the trombone. Later on, I took up the piano, various woodwinds, and that ubiquitous, indispensable accessory of the rock generation -- the guitar. I composed my first large work at 16, a multi-movement jazz suite. Other works followed in a variety of forms, from songs and music for jazz ensemble to a string quartet. By the time I entered college, I already thought of myself as a composer, albeit an inexperienced one. After a few semesters, I decided to leave the university and seek my fortune in Hollywood, while simultaneously pursuing my interests in composing concert and chamber music. Thereafter I studied privately -- form, counterpoint, conducting, and film scoring -- in order to learn my craft. Soon I had opportunity to collaborate on the scores for various episodes of series television. After a few years of apprenticeship in this manner, I struck out on my own, writing professionally for television and feature films, as well as fulfilling commissions for the theatre and the concert hall. Please refer to the bio on my website for additional information. How would you define your style and influences? My influences are primarily 20th century composers, though my listening habits are wildly eclectic. My compositional style combines a natural lyricism with acerbic harmony and counterpoint. I love dance-like rhythms and irregular time signatures, colorful orchestration, and narrative forms that take the listener on a journey. I believe that music is not merely a mode of self-expression, but a medium for communication, and I seek to write music that appeals to the whole of a person -- heart and mind, body and spirit. I have always had a particular affection for vocal music. The human voice is a powerful, vulnerable, perilous, sensitive, maddening, and heartbreaking instrument, a heaven-bound exhalation of the first breath with which God inspired man. Even the spoken word rides on its own mysterious rhythms, in an aural landscape colored by subtle shadings of pitch and timbre. The range of vocal music that I enjoy has yet to find its boundaries, but in the midst of this variety, I especially love the English boys choir tradition. Apart from the sound of the singing voice itself, there is a second facet of vocal music that I love equally: the unique marriage it makes of music and words. In the pantheon of the arts, poetry is nearly as important to me as music. So when I set out to compose a vocal work, the choice of a text is critical to me. My goal is always to illuminate the words -- as the monks of the Middle Ages illuminated their manuscripts -- so that the audience gains a new understanding of the poem after hearing it sung. To achieve this, I try to let the natural accents and rhythms of the spoken words dictate the rhythms of the music. Since you often write music for popular media, do you think that all music has to be accessible to everyone? No, but I think it has to be accessible to someone, even if that someone inhabits a time yet future. Because I believe that music exists for communication as well as for self–expression, communicating effectively with an audience is important to me. One way to make music more accessible is by attaching it to an extra-musical idea or narrative. While much of my work is written in this way, I don’t compose exclusively programmatic music. Do you make a habit of listening to the scores of other composers? What kind of music commands your attention? Yes! I listen to them and I study them. I listen primarily to classical music and my tastes run the gamut from contemporary choral and orchestral works to sacred Medieval music. I love opera and musical theater. There are also many classic and contemporary film scores in my library. In addition to formally composed music, I’ve been listening regularly to traditional music from England, Ireland and Scotland since I was a teenager. I love rock ‘n’ roll and the blues, and there are a number of singer/songwriters whose work I enjoy. I don’t generally think in terms of favorites, but rather of the particular virtues of individual works. References to many compositions that spoke deeply to me as I discovered myself are strewn throughout my book. In fact, one might say that, in part, the book is about the influence of these works on a human soul -- namely, mine. What is required to be an effective composer for film. Do you have to be a “concert” level pianist? No, one needn’t be a concert pianist to compose for film. I’m certainly not! It does help to have some facility on the keyboard, however. Current technology has made that a necessity. I learned my own craft through a deep exposure to all kinds of music, by listening broadly and reflectively, playing many instruments and studying scores and technique on my own and with teachers, mentors and colleagues. Film composition straddles the fence between formal and intuitive processes. In my view, the best preparation for any formal composer is to become deeply acquainted with the basic elements of music (melody, harmony, rhythm, color and form) as well as its practices (theory, counterpoint and orchestration). To a certain extent, one can learn these things by experience. Nevertheless, there are some techniques of music composition that must necessarily be taught in order for a composer to speak effectively by formal means with a unique and personal voice. Even where the most intuitive music is concerned, I believe that content is still king and the quality of the musical ideas has a direct bearing on the quality of our responses. The technical issues of synchronization in film are relatively simple and secondary, especially in the computer era. I realize that these views are not the only valid ones, nor are they the most popular. I must confess that it grieves me when the disciplines of music are shouldered aside by sheer adrenal stimulation. Moreover, in the course of my career, I've seen my line of work devolve from a craft-driven guild to a celebrity-driven business. I hope that’s not where the story ends. There are many names listed in the music credits at the end of a film. How are the tasks of the composer distributed? Most scores are team efforts with the purely musical tasks, such as composition, arranging, orchestration and conducting, along with various business or computer-related activities, divided among a group of professionals overseen by the primary composer. Many forces contribute to this delegation of duties: short post-production schedules that leave composers limited time to create, the obligation of submitting computer mock-ups for approval of cues prior to final recording, the prevalence of computer-generated methods of composition, the necessity of building or matching temp tracks, the process in which preview audiences are polled for their reactions to films precipitating last-minute picture changes, and the ascendance of business over artistic concerns. Each of these points could be a sub-heading in an extended essay on the subject, one too large to be adequately addressed here. The composer sometimes ends up working like a picture editor, providing raw musical material for a director or producer to manipulate at will. Computer technology has made all of this possible and has contributed to the compartmentalization of the work of the composer, as well as the unfortunate homogenization of film scores in recent years. Nevertheless, there are still opportunities for a composer to compose, arrange, orchestrate, and conduct his or her own music, as composers like Bernard Herrmann used to do. These opportunities, however, are increasingly rare. Is there any particular style of score or film genre that you haven’t yet scored that you’d really like to do? It would be fun to do a horror movie -- not a slasher picture, but a good old-fashioned ghost story. For the right film, I’d love to compose an all choral score. I would also relish working with small groups of instruments on more intimate, independent films like The Trip to Bountiful. Do you prefer composing film scores or concert works, or is it all the same? The collaborative nature of film music highlights what are perhaps the two most important distinctions between film scores and concert or chamber compositions. The first and most obvious distinction has to do with the function of the music. Film scores are written primarily for commercial purposes in a popular entertainment medium. As such, musical integrity is easily trumped by the box office. Producers, directors, executives - and their relatives - may dictate the content of a score based on prevailing trends in the marketplace, rather than trust the dramatic sensibilities of a composer. Responsibility for the final product can therefore be somewhat ambiguous: one can never be sure whether a particular dramatic or musical decision was made by the composer or requested by the producer. While it would be extremely naive to suppose that comparable situations don’t arise in the concert music world, especially where commissions are involved, for the most part a concert composer is free to make his or her own artistic determinations and the work ultimately represents the composer’s craft and taste alone. The second and more significant of the distinctions between film and concert music concerns the content of the work. Where the character of a film composer’s discourse is largely limited by the aspirations of the movie for which he or she is writing (though there are many notable examples of brilliant scores that have utterly transcended their films), the concert music composer’s ideas can range as far as the frontiers of his or her own imagination. Because film music, in most cases, is designed to accompany other sounds, to say nothing of the visual images, it must, of necessity, be of a simpler character than music that demands the full focus of the listener. Concert and chamber music offer more opportunity for a composer to speak deeply and at length, without interruption, from the inner resources of his or her own soul. This is what I hope to achieve when I compose for the concert or recital hall, and the fierce desire to do so is what keeps me engaged in this pursuit even to the point of personal sacrifice. 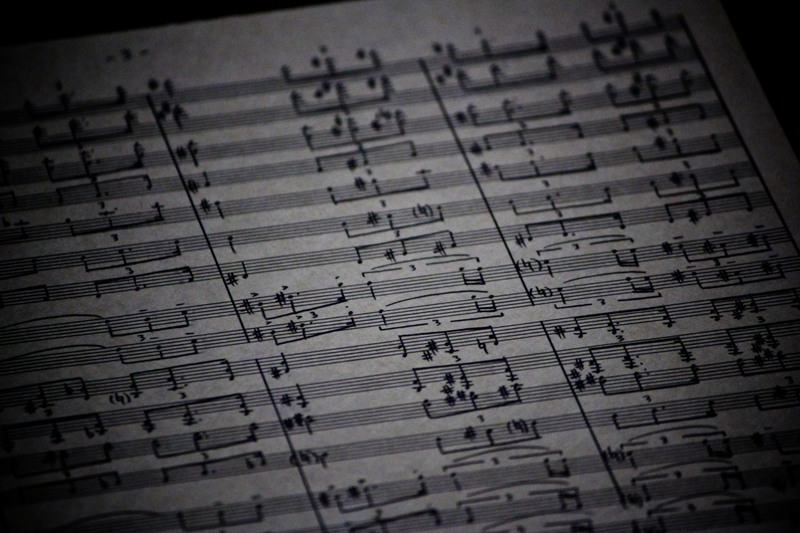 Traditionally, orchestration involves assigning the written notes of a musical composition to orchestral instruments. This is frequently part of the composition process itself. However, orchestration, Hollywood-style, can run the gamut from glorified copy work (in the case of a composer’s detailed sketch) to transforming a few seconds of hummed tune into a lengthy full-scale orchestral cue. Composers of the latter variety are sometimes called “hummers.” In my own case, I’ve been fortunate to work with inspired, highly educated and articulate composers who continue to produce remarkable music without buzzing their lips! Are orchestrations worked out by trial and error, or are they the fruit of years of experience? How does one learn to orchestrate? The sounds of instruments and possibilities of relationships between them are in my head like a form of language. This is the case largely because I've listened to so many hours of concert, chamber and choral music, both live and recorded, especially from the 20th century. I think this is a good place to start. Then, of course, one needs to study. There are many non-intuitive aspects of making music that must simply be learned, usually from a mentor. Once the vocabulary and grammar of a language is learned, one can begin to speak it fluently, without thinking about every syllable. Does an orchestrator have the freedom to modify the harmonic structure of the score? As an orchestrator, I never suggest modifications to the harmonic structure of a score unless I am asked to do so. I believe harmony is a fundamental feature of the composer’s “voice” and I respect it as I would like my own voice to be respected in my scores. Composing is my primary vocation and I find it very fulfilling, which is to say that it is alternately a source of ecstasy and despair. Orchestrating and conducting are fulfilling in different ways. It is, for instance, very satisfying to serve others and it’s good for the ego as well. I don’t have a problem working for anyone who treats his or her fellow human beings with respect. Are orchestrators well respected in Hollywood? Is there a union or some other structure to protect their interests? Orchestrators are well-respected in Hollywood by their peers, by studio musicians, and by most composers, as well as by a few enlightened producers and directors. Most filmmakers, however, have no idea what an orchestrator actually does and cannot substantively differentiate orchestration from composition. These filmmakers are most comfortable viewing the orchestrator as a “composer’s assistant.” Orchestration and conducting fall within the category of work covered by the AFM (American Federation of Musicians), while composing, per se, does not. There are also a few professional organizations like ASMA (American Society of Music Arrangers) and the SCL (Society of Composers and Lyricists) that include orchestrators.